Marten Transport Ltd. reported higher profits and revenue in the first quarter of 2018 as the Mondovi, Wis.-based truckload carrier benefited from lower taxes and stronger demand for freight hauling. The company earned $10.3 million, or 19 cents a share, in the three months ended March 31, compared with $8.2 million, or 15 cents, in the same period a year ago. Revenue climbed 8% to $187 million in what normally is the slowest quarter of the year for Marten, which primarily hauls food and other temperature-sensitive goods. The company generated revenue of $173.2 million in the same period a year ago. CEO Randolph Marten said he expects growth to continue throughout the year. 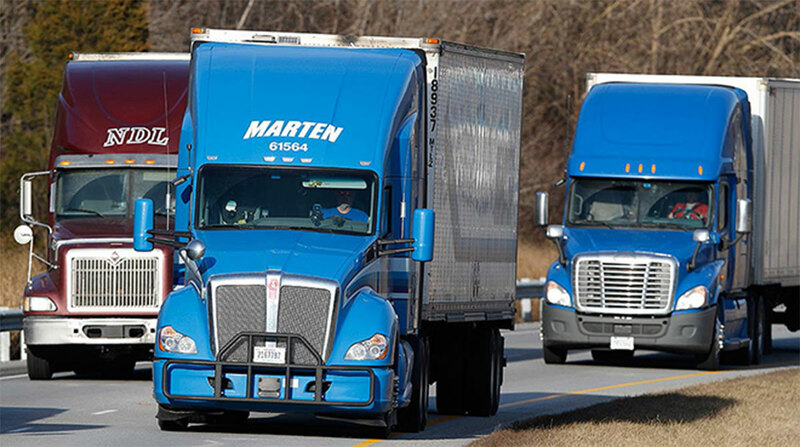 “We expect to deliver revenue and profitability growth throughout 2018 with increased compensation for our premium services, additional freight with existing and new customers, and our continued emphasis on cost control,” Marten said in a statement released April 19. Marten provides refrigerated and dry van truckload, dedicated contract carriage, intermodal and freight brokerage services and ranks No. 46 on the Transport Topics Top 100 list of largest for-hire carriers in North America.